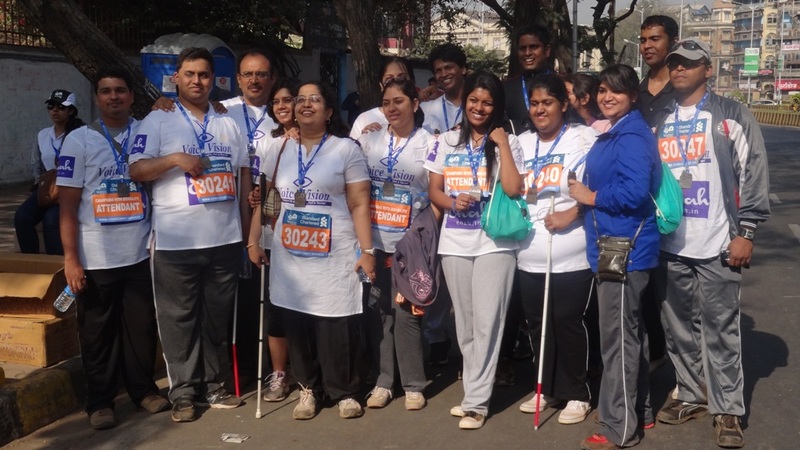 Voice Vision, participated in the 2013 Standard Chartered Mumbai Marathon which was held on 20th January, under the category “Champions with Disabilities Run”. Voice Vision takes great honour and pride to inform that with our persistent follow up, we were instrumental in persuading the marathon organizers to change the name from “Wheel Chair Run” to “Champions with Disabilities Run”. We wish to express our gratitude to the General Manager of PROCAM International Ltd. and the entire team for going out of their way & making this change possible. Voice Vision – “Vision is a Thought ….. Not a Sense” Voice Vision’s aim in running the marathon was to make the able & healthy world aware of our existence with a view to sensitize them to our impairment, and to fight the external social prejudice and internal barrier of a sorry face, dark glasses and a white cane, by involving visually impaired persons in an activity which proved to be both challenging as well as socially fulfilling for them. The Champions with Disabilities Run began at 7:35 a.m. at Mahapalika Marg, near CST station. It was a two and half kilometres run and there were a total of eight visually impaired participants along with their escorts running on behalf of Voice Vision. The finish line was at the MSSA office, Mahapalika Marg, where the runners were felicitated with medals and certificates. We appreciate the inclusive effort of the Marathon organisers and extend our heartfelt gratitude to them. And by our participation, we wish to pass on the message that all efforts made to include us in the “normal” activities have been mutually gratifying and progressive. We would also like to express our heartfelt gratitude to “ENHA” for sponsoring and designing the beautiful attires for the Voice Vision marathon runners www.enha.in . Special grattitude to all the escorts, without whom participating in the race would be out of question. Next PostNext Development & Communication : Personality Development & Public Speaking Workshop on 13th Anniversary Celebration!